In part 1 of exciting football news regarding Toronto FC and Brits in Toronto, the two hugely successful organizations have partnered up as BFFs to offer some decent ticket discounts to the British community. If you’ve never seen a live TFC game before or are a Brit visiting Toronto on a scouting trip as a possible city to move to, then take full advantage of this offer, save some cash and pay a visit to BMO Field. BUT THAT’S NOT ALL! There will be some more exciting news soon whereby TFC and Brits in Toronto will host a meetup before the Sporting Kansas City game on Friday, June 7. 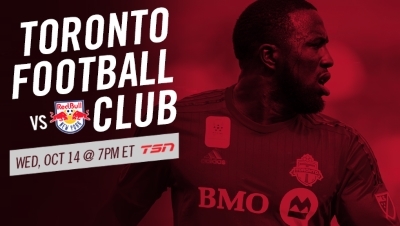 We’re talking pre-match pub … reserved seating area at the game … FREE stuff … and end-to-end action with tons of goals (for TFC, obvs). So mark your calendar to “work from home” that day because it’s about time we all met for a chinwag, beers (ginger ale if you’re driving) and some ruddy good fun with the Brits in Toronto community. Click here and use the password “BritsInToronto” to get up to 25%* off the ticket price. The flyer is here if you wanted to check it out. For additional information, season ticket questions or to book a group of 10 or more, please contact fellow Brit in Toronto Jake Wyatt at jake.wyatt@mlse.com or give him a bell on the dog and bone at 416-815-5400 ext. 3072. Please tell him Brits in Toronto sent you! *Discount percentage calculated off on single ticket price + any eligible service fees. This entry was posted in Uncategorized and tagged bmo field, brits in toronto, football, tfc, toronto fc on April 4, 2019 by britsintoronto. History could be made tonight when TFC plays host at BMO Field to the New York Red Bulls at 7:00 p.m. With just a victory or a draw, TFC can seal a place in the 2015 MLS Cup Playoffs for the first time in club history. This is huge news for football fans in Toronto. The club has had its ups and downs, for sure. Who can recall when former Toronto Mayor David Miller famously gave up his season tickets in utter disappointment? But you can’t change history. Unless you’re Doctor Who. Or Superman flying really fast around the planet so it spins backwards. So, let’s all get behind the lads tonight — and their coaches and backroom staff — and cheer them on to the next chapter in their history! This entry was posted in Uncategorized and tagged brits in toronto, tfc, toronto fc on October 14, 2015 by britsintoronto. 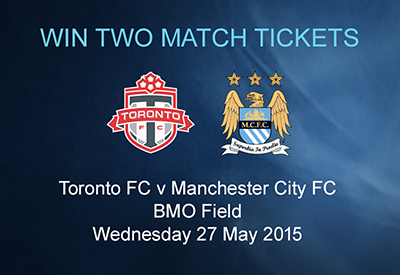 CONTEST: We have five pairs of tickets to Toronto FC vs. Manchester City FC up for grabs! How good is that, eh? Ever since Toronto FC announced a friendly against THE Manchester City FC on May 27 at BMO Field, Brits in Toronto wanted to get involved in some small way. We love these games where the Premiership is pitted against MLS, in our adopted city of Toronto. And thanks to our very generous friends at Manchester City FC, we have an exclusive free contest where you can win one of five — yes, five — pairs of tickets to see the match! Some of the Brits in Toronto crew attended the Toronto FC vs. Tottenham Hotspur friendly last summer, and let us tell you — whatever your team allegiance — it was an amazing occasion, full of atmosphere and excitement. Tons of fellow Brits there too, obviously. 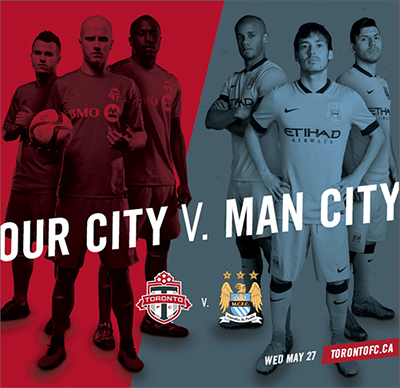 We have no doubt that TFC vs. MCFC will be exactly the same, and we’re pumped. Who will take it? Red blokes or blue blokes? Be there! So, how can you win the chance to grab a pair of free tickets? Simply click this exclusive Brits in Toronto link, fill out some quick details and a representative from MCFC will pick five winners of two tickets each. This entry was posted in Uncategorized and tagged bmo field, brits in toronto, football, manchester city fc, mcfc, mcfc vs tfc, soccer, tfc, tfc vs mcfc, toronto fc on April 23, 2015 by britsintoronto.